Here is an example VI (LV7.0) that shows how to manipulate text in a text box. The focus of this example is the Selection Start + Selection End property. This can be very powerful in performing custom live formatting of front panel text. The trick here is to perform formatting on the text after you highlite the section of interest. The Font property is then used within the same property node. When I originally was after this sort of thing I was using it to create a ?simple? text editor and the highlighting was for the FIND method. It works nicely (apart from a brief flash as the text is highlighted). Now is it possible to extend this to give me real time <cough> syntax highlighting? By that I mean as I type 'word' and word is in my list of defined text strings to be green, it gets coloured green. I reckon this could be done with the text select and highlight method outlined before, but it might be pretty ugly (flash, flash, etc), especially when loading and parsing a file for syntax highlighting at startup. Now is it possible to extend this to give me real time <cough> syntax highlighting? I don't see why not? Have you tried it? What problems are you seeing? I reckon this could be done with the text select and highlight method outlined before, but it might be pretty ugly (flash, flash, etc). I didn't see any flashing on my end in the examples posted previously. Open the attached VI using LV6.1 to see bug. In a recent Info-LabVIEW thread there was a need for HTML display. I have wired this SimpleFormatter.vi that accepts tagged (markup text) and display it in a string. With a syntax parser that will wrap keywords with property tags, it can be used for syntax highlight. It still require some work (to handle the character "<") and has merely been tested with the provided example. The font property also needs to be implemented. Correct syntax is assumed. I defer panel updates when formatting the string but the string indicator is still drawn twice. 4. reformat the portions that should have kept their format. I made some tests and got (hope so) the problem on LV6.1 with undoing a text format. It seems that the SelStart and SelEnd marker have to reside on a text that is formated the way you want to undo. In between have as much different formatings as you want. E.g. if you want to undo bold on a text portion, the character after SelStart and the one before SelEnd have to be bold. The other way nothing happens. I've rewritten Michael's example with an event structure. It gives back the new value of the slider (to format the new portion) and the old value (to unformat). Excellent! I fiddled with this for an hour on Wednesday and could not figure out the odd behavior in LV 6.1. Your solution is great, it solves the problem exactly. I downloaded SimpleFormatter.vi and after using it, I found a small bug. All text after the last text formatter is truncated. I also modified the search for tags to be case independent, so now <b> = <B>. 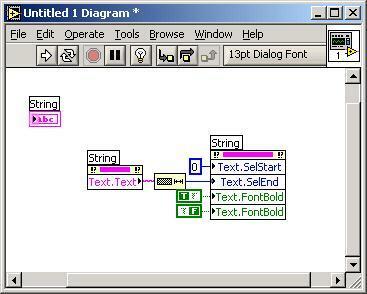 This new version is in LabVIEW 7.1. Thanks for this cool new tool jpdrolet.